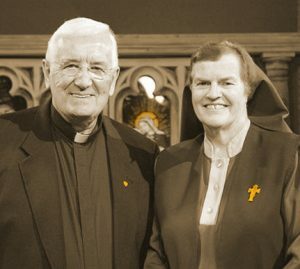 It is with great sadness that we share the news of the sudden passing of Fr. Kevin Scallon, CM, 83, a Vincentian priest of the Province of Ireland of the Congregation of the Mission. He left to join the Father on 25 June 2018. Fr. Kevin entered the seminary in 1953. He was ordained to the priesthood on 27 May 1961. In 1976, Fr. 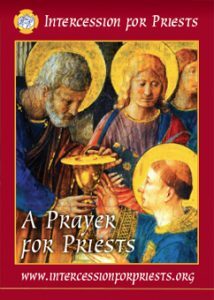 Kevin started the ‘Intercession for Priests,’ a movement to pray for the spiritual and pastoral renewal of the ordained ministry in the Catholic Church. He worked with Sr. Briege McKenna, of the Sisters of St. Clare, to minister to priests and lay people. He also served as a seminary spiritual director and missionary in Africa. Just before his death, he had been ministering at the Intercession for Priests in Europe. The INTERCESSION FOR PRIESTS in Ireland will begin this year at Knock Shrine on 6 August on the National Day of Prayer for Priests with a special day of gratitude in honour of Fr. Kevin Scallon, CM. The Intercession will then continue in Maynooth for the days to follow as planned. There is only one priesthood – the Priesthood of Christ; there is only one saving sacrifice, that which Jesus offered on the Cross. 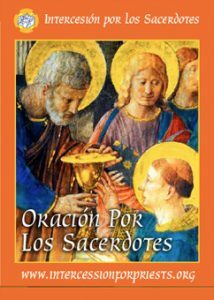 All of God’s people share in the priesthood through baptism in a spiritual and mystical way representing the Church – the Body of Christ. 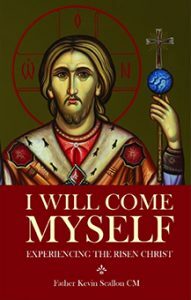 Ordained Priests share in it uniquely because they represent Christ, the Head of the Church. It is the ordained priestly ministry that makes it possible for the whole Church to exercise its spiritual priesthood because only the priest acting in persona Christi can make the offering of Christ really present among the people of God, who unite with Him in offering themselves. Bishops, priests and deacons everywhere. We pray that priests will be full of the love of Christ, that they will be secure in their identity and vocation and alive with the power of the Holy Spirit. We also pray in thanksgiving for the vast army of faithful priests that they may grow in the love of Christ. We pray for priests who are persecuted and imprisoned, who are rejected and poor. We pray that they will be protected from the deception of the evil one and safeguarded from confusion of doctrine and rebellion against authority in the Church. 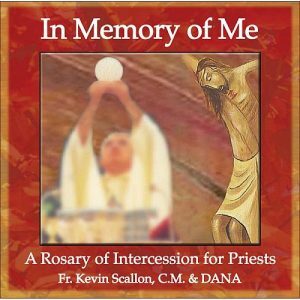 The Intercession for Priests was started by Father Kevin Scallon, C.M. at All Hallows College in 1976 in response to the great upheaval in the priesthood in the years following Vatican II. The years following Vatican II were a critical time for priests and many decided to leave the ministry. Those who persevere were trying to come to terms with the nature and demands of priestly ministry. Even then it seemed clear that the crises in the priesthood were not of the kind that would be resolved by human means, but by prayer and fasting. In the days of his flesh…offered up prayers and supplications with loud cries and tears (Heb. 5:7) and is able for all time to save those who approach God through him, since he always lives to make intercession for them. (Heb. 7:25). Providentially, Sr. Briege came on the very first day, 16th of July. Her love for the Church and for the priesthood was then, and now, unconditional. Her gift of ministering to priests is quite unique.